The Dolls are ready... and it's giveaway time!!!! I received a wonderful package during the weekend!!!! I was waiting for it anxiously and I almost ripped off when I finally got it! What was it, you're wondering? I colaborated with Jenny Doh in the creation of the bag, the Danita and Me kit and Viva la Vida and Alice in Wonderland stamps. I saw the previews, I saw the videos... but I hadn't seen them in person. Until now! Jenny was kind enough to send me my own bag and a sampler of the rest of the products, and I want to share them with you because I'm so excited and proud of them. I've been having so much fun with the stamps and I want you to have fun too! This is one of the sets, called "Viva la Vida". I haven't had time to play with them yet but Jenny did and she created some very pretty juice labels. Check them out here. This is one of the prizes. 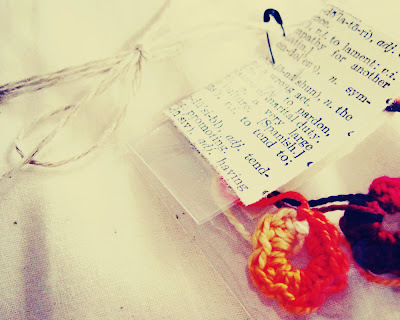 I used them for my journal and for some cards, but what I enjoyed the most doing were the tags for my finished dolls. 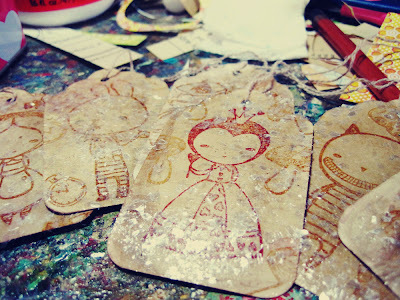 I used StazOn inkpads (which are my favorite) on coffee stained tags. Covered them with Modge Podge and dipped them in Mica flakes. Shake off the excess... and they are ready!!! The stamps are only available through Crescendoh, but to win your own here just leave a comment telling me which character of Alice in Wonderland is your favorite and why, and I'll pick 2 winners this Friday! (2 sets each). And by the way, the dolls are finished and ready to go to the shop and they will be available tomorrow at 12 EST. I have some extra good news to share with you, stay tuned! wow Danita they look wonderful!!! I would love to win one of these and spread the love round New Zealand. My fav alice in wonderland character is alice herself, I would just love to have an adventure like she does. Has to be the caterpillar, because he's my son's absolute favorite and anything that makes him that happy, makes me happy too. alice has always held a special place in my soul. her ability to adapt, be clever, and expand her creativity while being in the world she created is astonishing. Danita... you're pieces are amazing, as usual. My favorite character is the Queen of Hearts, as you've probably noticed... she's mean but in a funny funny way. Your dolls are awesome and so are your stamps! I love the Mad Hatter because "everyone's a bit mad". alice is absolutely my favorite. she is so sweet and imaginative and gets to travel on such wonderful fantastic journeys. Haven't seen the new movie yet but I've always been a fan of the zany and crazy Mad Hatter. He's the life of the party!! Oh I am so in love with your dolls. I'm assuming the give away is only for those in the US but I wanted to comment anyway :) My favourite character at the moment is the rabbit because of how cute you make him. You never know when he’ll choose to appear! I love all your art work on Alice. the stamps are really cool. my Alice fave character is the cheshire cat because it has an ironic smile and the hair in (pink) stripes. My favorite is the Mad Hatter because he is colorful, rare, different, and funny! i loved the queen of hearts in the movie.. i thought she played it so well! but i also like the fumbly bumbly white rabbit! I absolutely love all of these. The stamps are adorable!! I adore your art & have loved seeing all of your Alice in Wonderland goodies. We are big Alice fans in my house. We celebrated my daughter's birthday a couple of years ago with an Alice theme. She still loves to dress up as Alice!! She is definitely my favorite character. She is adventurous! I love those Alice stamps! I prefer your Alice to that Tim Burton mess! I love all of your art. It's just beautiful. Please sign me up for the drawing! Of course I love Alice...but I relate to that old cranky Red Queen more! Love your stamps. Congratulaitons on another successful venture! It all looks so fantastic. The cheshire cat is my favorite because my very first cat looks just like the original version. I love the cheshire cat so much I have a tattoo of him on my back, lol! my favorite character is the Cheshire cat - he's cute, he's sort of naughty and he's got great coloring! congrats on the rubber stamps - they are super cute! Alice is my favorite - I'd love to fall down a rabbit hole and see what adventures were in store for me ! The new stamps are gorgeous and I just love your tags! I think the Cheshire cat is my favorite because he's just a little bit ornery, like me! I love your new characters! My favourite character is the Chesire cat because I love cats and smiling alot. I love his big grin that he leaves behind. Cat most definately...why it has to be the way he moves and evaporates! Love your work and your ideas! Oh, these are just TOO yummy... gorgeous. Lovely work, lady! I have to say I love the Queen of Hearts. She's deliciously evil (unlike my perky self) and I bet she wears kicka$$ heels. (Also unlike me.) Thanks for the great post & giveaway! Danita, you should be so proud! How exciting to have your fabulous art made into stamps! My favorite character is The Mad Hatter. He's crazy, sweet and eccentric. LOVE your new work...the Alice theme is going to be a HUGE hit! HAS to be the Mad Hatter...I am CRAZY about Tea...and am actually hosting a Tea giveaway tomorrow, so you'll have to pop over to mine to enter. HUGS and thanks for Sharing! I love the Cheshire Cat. With that grin you know he's up to something. LOL!! I love the Chesire Cat! He always looks like he's keeping a great big, fun secret! I would like to feel that all the time too. Plus, I love the color! As for your dolls, they are amazing, especially the gorgeously colorful Mad Hatter! You are spectacularly creative. WOW! I love the stamps, but your dolls are gorgeous!!! I'm a serious Alice fan, too, but I'd have to choose the Cheshire Cat because he seems so all seeing, all knowing in an ironic sort of way. My favorite charachter is Alice... she is just lovely and so true... we are all Alice (in one way or another), don´t you think!? A big hug and lots of successes for you! These stamps are fantastic! My favorite character is Alice! I love how innocent yet tough she is. She gets put through the wringer and still remains poised and put together! My favorite A in Wonderland characters are Tweedle Dee and Tweedle Dum....I love them because of their roundness...and I love the way that their names sound!!! I love all the characters but if I had to pick a favorite it would have to be the Chesire Cat... his Zany disappearing Strips and Crazy Smile get me every time and I love his Antics! The Red Queen is pretty cool. She's sassy. DAnita!! Your Art is so Wonderful!! You shold be doing childrens story books!! Love it all, your the BEST"!! Mad Hatter! Madness and Tea Parties, and well awesome hats! Hi Danita!! Your stamps are "Wonderful"!! My wish for you is one day you will do some children's books!! Anyone can write one, the art is the hardest part. You have all the talent in the World!! I can see myself reading a book by you to the grand kid's!! Think about it?? I bet you can do stories around your "DArling Art"!! I love the Mad Hatter. He has such a variety of personalities, depending on the interpretation (although I don't love him any less in the original book). He's a really interesting character. Alice by far...you are so talented! My favorite characters in Alice in Wonderland are the talking flowers, especially the wee one...I love the creativity used in creating them and how they are so opinionated...just like me, lol. Hmmmm...I should do a flower doll now...yep...see, you are always inspiring me!! Have a good one Danita! The Hatter is my favorite, and not because Johnny Depp is playing him (although that certainly does not hurt, does it?). The Hatter has always been my favorite because he makes things, is constantly having tea, and is slightly off-kilter. Love the photo of the dolls you made, they are superb, especially the Tweedles! Wow, they are so beautiful!! The Alice in Wonderland set is gorgeous!! and your dolls... they are great!!! Yes I've seen allt hat on Crescendoh and I would love to win a set. I love the rabbit as he's always chasing after time- a lot like me. thanks so much Danita for this generous chance,it should be really great to win your amazing stamps! I honestly don't have a favorite character. But love the look of your stamps and would love to enter your giveaway. My favorite character is Alice...I would love to go on her Adventure in Wonderland! Your dolls and your artwork are wonderful. I always look forward to seeing them in the Somerset mags. I like Alice herself the most.. wouldn't it be great to make such an experience as she does during her magical journey? Ahhh Danita! More adorable work from you and your stamps are so adorable!! I think my favorite is the Cheshire Cat but all your craetions are fantastic!! ohh que lindo Danita!!! el mad hatter me fascina!!! y los sellitos son preciosos!!! estoy cruzando los dedos!! Oh what a great giveaway- I saw these on Crescendoh! oh! the stamps are fantastic and it is so difficult for me to find them here in greece! well my favourite is alice because she is like me! innocent!!! oh i wish i won them and put them on a new journal page on my blog! Alice is my favorite . love all her adventures. These stamps are so unique, and I adore them both, so I would be delighted to win either or both. Love the dolls, will check your site after 12 today. These stamps are so unique, I would love to win either or both. 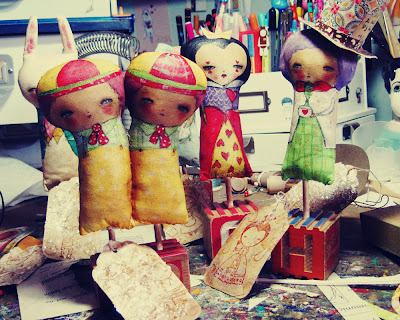 I love dolls, and the dolls in my studio watch over me while I create. LOVE the Mad Hatter doll! So glad for your success! You so deserve it. You truly inspire me! Please enter me in the giveaway. It would be such a blessing to win! amazing! love your artwork! my fave character(s) are the tweedles - double the fun whimsy! J'adore votre univers et vos timbres sont merveilleux. Mon préfèré est celui d'Alice et j'adore Frida !!! So adorable!! I love your work!! The tags are a great idea to put on your dolls. I love the tweedle dee and tweedle dums, and your version is so creative w/ them stuck together! Love it all!! My favorite character is Alice, for no matter how difficult and strange her path turned, she always kept going beyond truth and logic... A life's lesson learned! HA! Well it's hard for me to pick a favorite, but my Etsy shop is named after a quote from the mock turtle, "Well, I never heard it before, but it sounds uncommon nonsense." I LOVE that! And I LOVE your work!!!!! My favorite Alice in Wonderland character is Alice, for she always kept going beyond truth and logic, showing wit and bravery... A true life's lesson learned. I wanna win! I LOVE Tweedle dum and Tweedle Dee! oh Danita your dolls are absolutely adorable! my fave character in Alice is the mad hatter! I love him because he's a bit "cooky" but he has a heart and he's ok with "being mad".! hi danita! they are beautiful!!! my favorite character is the cheshire cat - his grin just cracks me up! hurray! they are Gorgeous, danita! i think you should be very, very proud of these. they are simply fabulous! if i had to pick only one favorite it would be very tough to do. but i would pick alice. and i would pick her because of her journey of discovery to find out she is so strong and able to think for herself all along. we all can use this lesson. xo! Love your work:-) I would have to say, as a Leo, probably the Cheshire Cat. My favorite Alice in Wonderland character is the Mad Hatter. He is just so fun! Absolutely gorgeous Danita! My favorite Alice character is the Cheshire cat...wise, mischievous, vexing, and philosophical, all at the same time. How can you not love that, I ask? "If you don't know which road to take, then it doesn't matter which road you take" (paraphrased from the Cat. My favorite character is The Caterpillar, I guess it is not Alice's favorite, but I love that he asks Alice really hard questions. "Whooo ... are ... you?" And the answer Alice gives: "I hardly know, sir, just at present- at least I know who I WAS when I got up this morning, but I think I must have been changed several times since then" I think are a perfect dialog. LOVE the QUEEN! Because she is the Queen!! My favorite is Alice, the most curious of girls. I wish I could find a Wonderland of my own. My favorite character is Alice herself because she faces all the trials of Wonderland with curiousity and courage...love the stamps! Oh these are so wonderful! My favorite character?? Love the Cheshire Cat and the Mad Hatter, but then again, the rabbit....I think I love them all. Well done you... so deserved and of course they all look gorgeous.. I love your dolls too by the way. My fav is of course the mad hatter. Thanks so much for sharing the love. My favorite is Alice the adventurous spirit who discovers Wonderland wonderful! I love the Alice In Wonderland !! ooh! i so love how all of your characters are so stylized and still come out looking like "you". that is what i love to see. 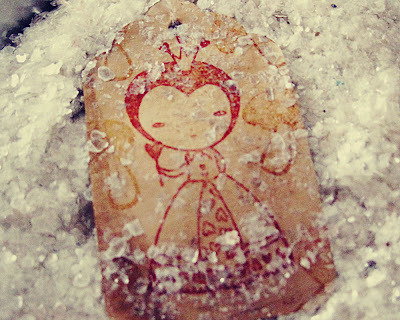 i love how gorgeous your tags look with the mica flakes too-magic! my favourite alice in wonderland character would have to be alice herself. there are many reasons for this, but mainly it is because of all the story book characters, alice is my mom's favourite. since i was a little girl i have always loved snow white(i love your version of snow white by the way). one year for easter(and as a surprise) my mom made me a cloth snow white doll. i couldn't believe it-she is gorgeous. this doll made me want to make dolls. and, because my mom never had an alice doll, i told her i would make her one when i grew up. fast forward to my mom getting her black belt at 55. to surprise her, i gave her my version of alice as one of my art dolls and she was so surprised she cried. this kind of thing goes deep! we have to keep the magic going! wishing you all the best with your art as it grows and grows and grows and i am very curious about your surprise too. OF course I LOVE you and everything you make! I hope they sell like hot cakes. Congrats on the collaberation! Love your items that you created for them!! The stamps are fantastical!! 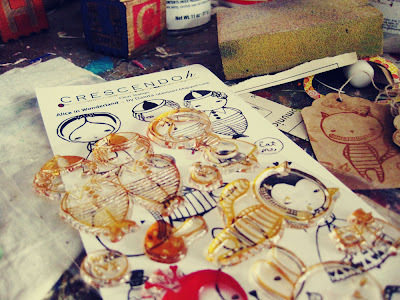 Beautiful stamps and creations. I love Alice, what a great adventure she gets to have. I think everyone needs an adventure at least once. Wow these are so cool!! Congratulations!!! I would love to enter your competition and I'd have to say that the Mad Hatter is my favourite!! i'm torn. i love alice, especially in tim burton's world, because she learns to stand up for herself and find her own way. but oh that mad hatter in all his insanity. he makes me want to have tea and talk nonsensically. all the time. <3 love your stuff and would be totally psyched to win! thanks! I think I'm not so original because my favourite is Alice too, althought I have a special love for the Mad Hatter too! Thanks so much for the chance. I love your work! A big hug to you! Danita, LOVE the dolls, they are so wonderful! My favorite Alice character is the Cheshire cat--because of the dreamy eyes and toothy grin. :-) Also, the stripy tail! I forgot to mention our favorite character, it's the Cheshire Cat. That whimsicle smile. Oh gosh Danita! Stamps designed by you too...you have outdone yourself again! Congratulations! My favorite Alice in Wonderland character is the Queen of Hearts, she's just so outrageous and I am a queen at heart myself. I LOVE THOSE ALICE STAMPS! ohh this is a hard question because I adore all the characters, but right now I will choose the DorMouse. I think he adds a little something something and tends to get overlooked in the original and some of the remakes, well except in the latest version. Twinkle twinkle little bat, how I wonder where your at, up above the world you fly, like a tea tray in the sky. Twinkle twinkle little bat! Love, love, LOVE your Frida Kahlo artwork. I am an art teacher and my students are fascinated with her because she is so very interesting. Well, my favorite character from Alice would be the Mad Hatter because he is so COLORFUL! I love the Queen of Hearts b/c she is an outspoken, commanding woman who (kind of) knows what she wants! sooooooo beautiful, all your work really. i have a huge crush on frida, the original, and your versions. I choose your rabbit. I love the chesire cat too. mischief sweet mischief! Wow, the dolls are so cute! And- I've been seeing the use of salt for special effects alot lately, perhaps I will try it. My favorite character would have to be the Cheshire cat~ Who doesn't lot a disappearing feline? Adorable. Oh!! Yo tengo en mi casa unas hermosas Frida's tuyas! Admiro muchisimo tu trabajo! Oh those are soooo sweet!! My favorite character is The Queen of Hearts!! He's so charmingly clever! Meow! I love your dolls and the tags you made to go with them. I think these stamp sets are great! My favorite character is Alice but the Cheshire Cat is a really close second. 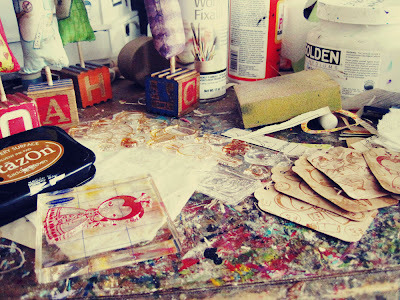 I love the stamps and i may have to try that mica idea. I love Alice through and through because you see wonderland through her eyes. Amazing how magical mica flakes make things look. The stamps look wonderful. I would have to say "Alice". Without Alice, none of the other characters come to life. Everything is just so beautiful! Fabulous! Alice is definitely my favorite. I can totally relate to her curious nature. Your stamps are sooooooooooo nice! My fav character is the magic cat. It's named STREGATTO in the italian language. He is so clever! I stay with my fingers crossed! Alice in Wonderland and Through the Looking Glass were my favorite books as a child! I must have read them a hundred time! My fav? Alice of course! Not for any reason other than I wanted to be her, to have her adventures. I wanted to grow and shrink and talk to cats and caterpillars. So fun! I'd love to get one of these! My Favorite character is Alice, it's is so cute!!! Your "Alice in Wonderland" is so very you and very unique. I have always been a fan of the mad hatter, probably a combination of the hat and the way he looks at his world... For me, he is the most poignant of the characters. Wow! 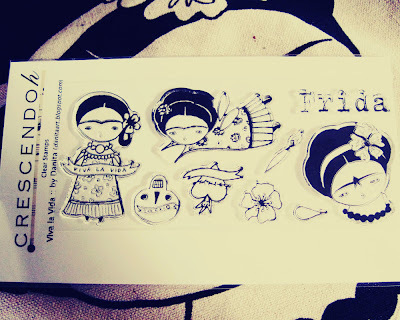 Alice and Frida stamps! Alice is my favorite character because she's the one who gets to have the adventure! Cheshire Cat is my favorite one because the cat's grin is immense! The grin tells the whole story of the character I think. A bit devilish at heart but very intelligent and alert and aware! The Cheshire Cat is an icon in its own right independent of Alice in Wonderland,because you could put the Cat anywhere and it is going to stand out perfectly! I LOVE TweedleDee and TweedleDum. They are just so cute and always make me smile. I would say my favorite Alice in Wonderland character is the Mad Hatter, because he is so generous and he tries to help Alice. But while helping Alice he gets locked up and becomes the Red Queen's hatter. Also, because he is so creative and his hats are something you do not see everyday. I try to collect all the versions of Alice that I can--including the 1933 version, and Meryl Streep in "Alice at the Palace." My favorite Alice in Wonderland character is the jabberwocki! I really like monsters and he was pretty incredible. I love the new stamps and bag!! Congrats on all your success lately. 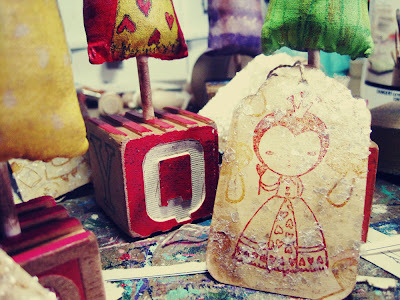 wonderful tiny dolls and the stamps are cool gotta.. getta them! Thanks!Favorite character in 'Alice in Wonderland' well it depends on my mood.. sometimes I want to be Alice so I could be on this amazing adventure and wear that nice apron, then hmmm to be the Chesire cat to be everytwhere and no all.. but with my weakenessfor rabbits.. it has to the White Rabbit! Why?? Because its a 'rabbit'! and he talks and wears that cute waist coat..would love to chat with a rabbit and stroke his soft ears! They're lovely Danita, and so are the dolls! I have many favourites in Alice... In the book, my favourite has to be the white rabbit, as I'm always late myself! I just LOVE love LOVE the mad hatter! But then I love everything thing that you do. I love the dolls with the mica flakes on them. Fantastic looking!!! But then, all of your art is great. You are a very accomplished and wonderful artist! OMG! I am number 141! My favorite characters are Tweedle Dee and Tweedle Dum! They are so funny like Laurel and Hardy to me! I love all of Alice and Wonderland, it is my favorite book of all time. My favorite piece is Twas Brilig and Slythy Troves did Gyre and Gimble in the wabe. All Mimsy were the burroughgroves the Momraths outgrabe! Now I may have misspelled some words here but maybe that is the point! I would love to see you do the tweedle boys! I always loved Alice because she could think of 6 impossible things before breakfast. What isn't to like about creativity like that? My favorites are Tweedledee and Tweedledum....Your character dolls are wonderful!...and Oh SO Clever! Thank you for sharing your art! Have a great evening and can't wait to hear your news. I've been following your blog for quite some time now and on Etsy. I just love your creative mind. My favorite Alice in Wonderland Character is the Queen... I loved her in the remake. I love her big head and her heart shaped lips. Plus I love her bitchiness. Sometimes I get a little on my own nerves from being so nice but I cant help it. Its who I am, so I always seem to like the evil characters in movies because it balances me out... Lol. Thank you for always sharing your art with us. How gorgeous these stamps and dolls are! My favourite character as always be the cheshire cat. I am yet to see the new film, but still have wonderful memories of the Disney version. I saw it for the first time as a very little girl at our local library. I remember feeling so consumed and forgetting where I was and shrieking. I'd have to say my favorite is the Queen of Hearts. She was my first experience with a "diva". She was terrifying, but also fabulous. The Queen rules b/c she is a outspoken, independent and a fierce diva! Love the stamps. Amazing and inspiring!!! Love them all. I'm On the latest "WHERE WOMEN CREATE" Book!